Hazelnuts, also called filberts, are a healthy snack. They are high in folate, vitamin E and monounsaturated fat -- the "good" fat. 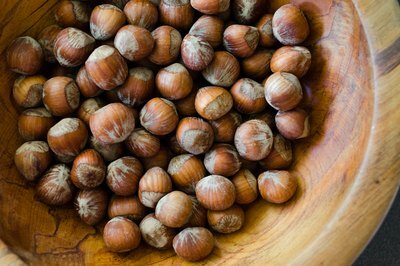 It is this high-fat content that contributes to the hazelnut's creamy texture and allows it to pair so well with chocolate, especially when roasted. Roasting -- a process that is easy to do at home -- brings out the robust, earthy flavor in the nut. 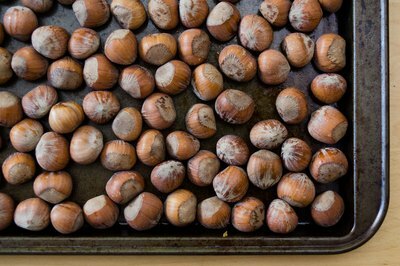 Spread raw hazelnuts, still in their shells, in a single layer on a large baking sheet. 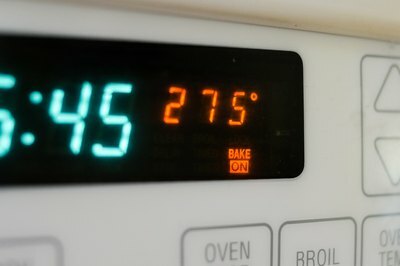 Place the pan in an oven that has been preheated to 275 degrees Fahrenheit. Using an oven mitt to protect your hands, remove one nut from the pan after 20 minutes and crack it open. If the color of the nut meat is creamy white, it is not finished roasting. Roast the nuts for another five minutes and check again. 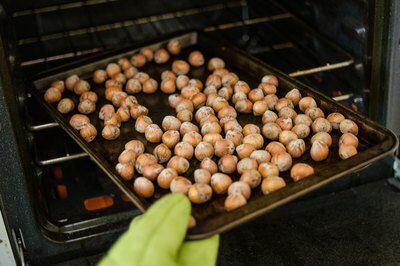 If the meat of the nut is slightly golden, the nuts are done and should be removed from the oven immediately. Pour roasted nuts onto a cool pan or into a large wooden bowl so that they don't continue to absorb heat from the pan.